Lorgat report: Can SLC shed its political skin? When you keep running in the wilderness, there is a time when you stop and realise that at one point you had taken the wrong turn. The moment I learned that Haroon Lorgat – the former ICC chief – was coming to Colombo to rake through the cricket dirt and formulate a fresh plan, I was sceptical.No rogue would go to the police station and unfold his bundle of loot. Yet, the SLC has been bold enough to ask Lorgat to see where it went wrong and advise it on what should be done. Now that the SLC is in the possession of the Lorgat report, it is up to it to see it is put into action. What is good in that report is that Lorgat has not said anything that the stakeholders in cricket or the others associated with the game do not know. He has spoken the basic truth, but even at a cost of US$ 100,000 the report coming from a person of his calibre is worth its weight in any currency. i) A need for leadership (at all levels) to rebuild confidence and trust across the board which encompasses a permanent change in culture and attitude. ii) Develop an environment that breeds professionalism, responsibility and accountability – essential for any organisation to succeed. iii) A proactive approach to managing the image and the reputation of SLC. iv) Engage with the relevant authorities to review laws that create potential for government interference. After speaking to 42 stakeholders of different walks of cricket it seems that Lorgat has run through the marshes. Yet, within the present scenario can it be possible? Even if some individuals may want it, how are they going to break this stubborn frame? Re-building trust: First we have to stroll into the avenue where how this present administration came into being after seven years of interim administrations. Under ICC pressure to break political interference in the game, the Sports Minister may have reluctantly decided to call for elections to appoint office bearers to the SLC administration. But, what happened? Anyone can come up with any explanation that he has, but the administration that came into power was the one that got the political nod. The president and the others came uncontested through one back door while the secretary came through another back door. These are not secrets, but, when one puts the facts in black and white it looks a bit damning. Yet, it is the truth and even the most junior stakeholder knows it. Lorgat specifically mentioned what has happened in the past is past and he is talking of a new dawn. That is exactly what he calls his ten-page report. Yet to build a new future the past stands as the foundation of the new structure. Then in the second pinpoint Lorgat talks of an outdated SLC constitution and a governance model that does not conform to global best practice and is not fit for modern day needs. In his recommendation, he suggests a complete redraft of the constitution which cascades through a board of directors with relevant expertise and independence. This also includes a code of ethics. With the present club-based structure and persons who are more interested in making a living out of cricket rather than let the game survive through their skills, a restructure of the constitution may become a huge task. saddled during the construction of the stadia in 2010/11, and speaks of state assistance to overcome them. This is the area where the SLC lost its face. Though the justification is there for the need to take the game out of Colombo, yet we ask didn’t the SLC bite more than it could chew as a result of some political obligations? The truth is no secret. Then yes, the government should at least help SLC with soft loans and bail it out of its current predicament. Thereafter the financial sector of SLC should be run by professionals and not people who can make a buck out of any deal. In the fourth and fifth clauses, he touches on the lack of professional administration and a non-existent organisational structure. In his recommendation, Lorgat speaks of having the organisation run by a team led by the CEO and a reduced executive committee to focus on policy and strategic matters. Besides that, there should be openness and information sharing across the organisation. Under the politically manoeuvred current system, where walls have ears, team work comes only beyond the boundary line. This may be one the hardest tasks the administration has if it is interested in a genuine change. In the sixth tier, Lorgat mentions about the poor media relations and the lack of media protocols. In this we could find fault with SLC President Upali Dharmadasa who took over the task of handling the media. His attitude towards the media has not gone well with the fourth estate. This is largely a fault that has been designed by him. Mistrust of the media can lead to a lot of complications. In the seventh pinpoint, Lorgat talks about the domestic cricket structure that is neither optimal nor sustainable and thus not developing excellence. This very column had delved deeper into this subject more than once and in Lorgat’s assertion he means that there should be changes made, but, how far can these recommendations move with the stubborn, deep-rooted club structure is worth waiting for. In point eight Lorgat speaks about the archaic sports law that has stands as a hindrance to the independence of the game. 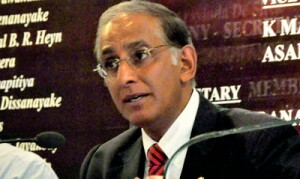 He emphasises that the selection committee should be an independent body, not maligned with the Sports Minister. Today, there are some selectors who do not get dropped. There is no room for fresh thinking because some selectors get in through their political affiliations. Finally he also talks about the upgrading of the high performance centre which polishes the product to face the modern challenges thrown at them in the international circus. All in all it is a revealing report where Lorgat has dealt with matters that will make Lankan cricket of tomorrow a success. When a report of this nature comes from a person of that calibre it tends to be taken more seriously than forwarded by a mere local. Yet Lorgat was prudent enough to compare his report to a doctor’s prescription. If the local administration is interested in moving on to the next millennium list of medications are spelled out. But, could the Lankans living in the post-1977 era shed cricket’s political skin and make it a viable independent entity with its own identity? Or will this 100,000-dollar report end up in the Dharmadasa or Ranatunga drawer? PS: It’s very prudent that the Sports Minister has forwarded these proposals to the Attorney General’s purview. Yes, the minister may change any clause in the sports law. But, can anyone rescue the sport from its current political shackle? What we contend is there should be complete freedom for the sport to run with an independent identity. Upali Dharmadasa has suddenly become omnipresent. Could KP cook the Indian goose?